We very much welcome contributions, both solicited and unsolicited, as long as they fall under the broader category of Arab culture and arts. 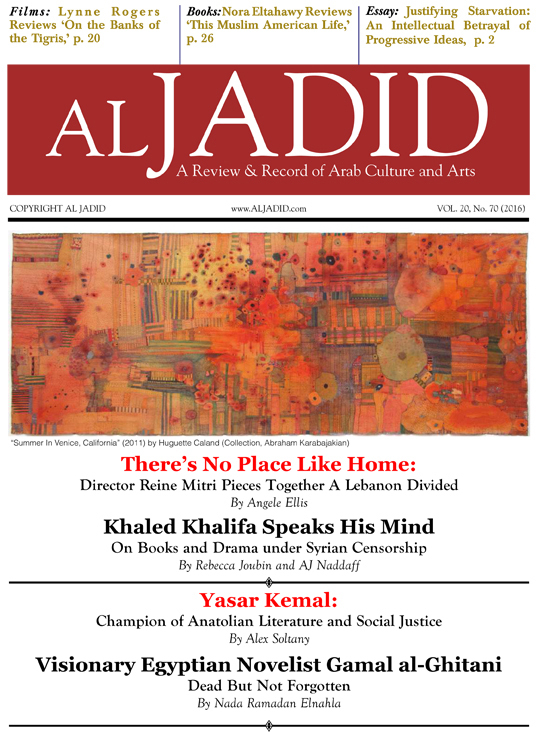 Contributions can be in the form of essays and features, reviews of books, films, music, theater, visual arts, and architecture, as well as discussions of cultural trends and intellectual debates; interviews with intellectuals and artists; and translations (from Arabic to English) of literary and creative works. We do not accept manuscripts that have appeared or are scheduled to appear in other publications, whether in print or online. 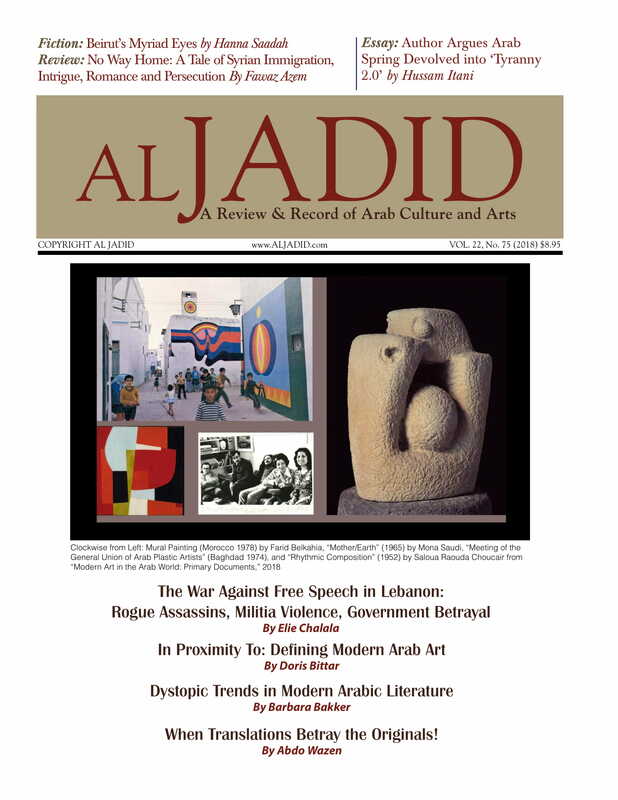 While we do not own the copyright, we ask that authors do not publish the same article appearing in Al Jadid elsewhere—whether in print and online—for two years from the time it appears in this magazine. After that time, it can be published whenever and wherever the author sees fit. 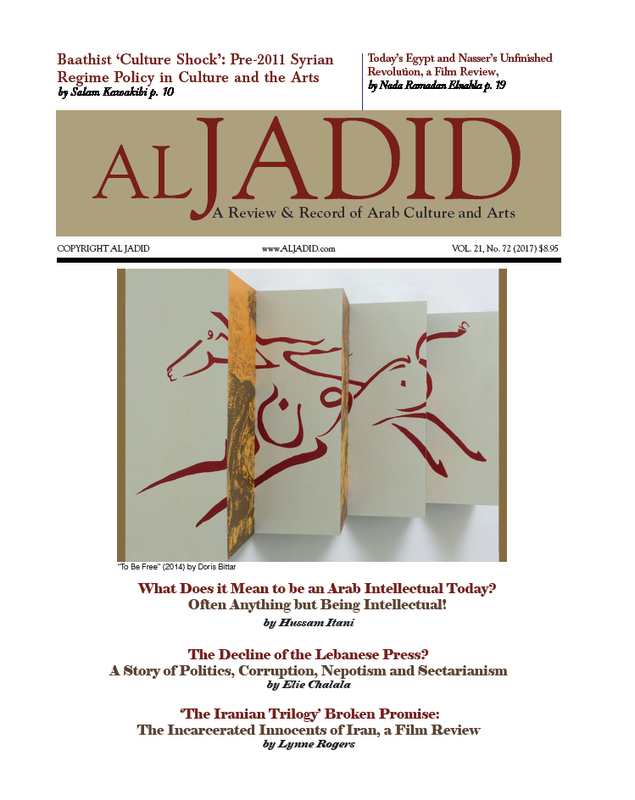 However, the first source, Al Jadid, will still need to be fully credited. 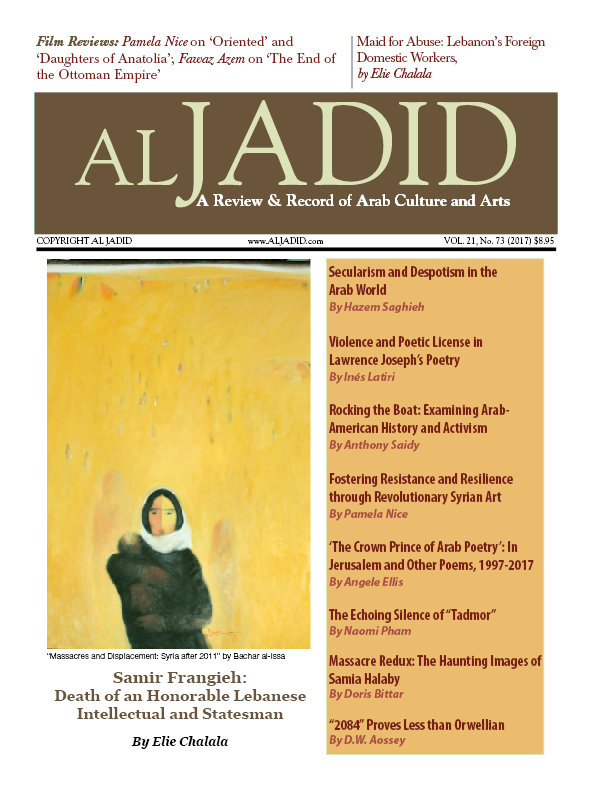 Meanwhile, we are entitled to post all submissions on our own website as well as in any future publications by Al Jadid. We are a not for profit organization, and all our contributors work on a strictly volunteer basis. In short, we have no budget for freelance contributions. Before submitting any work, we suggest that you send us a query, sharing your intended topic with us, thereby allowing us to inform you of whether we are interested in the topic or if we have covered it already. Finally, we urge authors to write in a style that is accessible to both specialist and non-specialist readers. Please avoid jargon, and abstract and technical language. We do not publish reviews of books that were published more than two years from the time the review is submitted. A book review should not exceed 500 words, while a feature/essay book review should be between 750 and 1000 words. We do not publish reviews of documentaries or films that were released three or more years from the time the review is submitted to Al Jadid. Our preference is for documentaries and films about and from the Arab world. The word length of a standard film review should not exceed 500 words. Feature film reviews, namely those profiling or including brief interviews with directors, are considered as well, with their word-length not to exceed 1000 words. In cases when the reviewers did not receive a review copy from the magazine, we ask that they provide us with two or more stills/images (jpeg or tiff at 300 dpi or higher) from the film to be used with the review. An essay or a feature should examine a topic or a theme in Arab culture and arts that is contemporary or modern. We are interested in submissions that examine specific themes rather than general theoretical discussions. Topics that are considered classics are also acceptable as long as they relate to contemporary discourse or contemporary issues. The word length of essays and features varies from 500 to 2500 words maximum. Do not submit any interview unless the name of the interviewee is cleared by us in advance. The artistic orientation and cultural production of the interviewee must contribute to the modern and contemporary discourse. The word-lengths vary from 750 to 1500 words. The interviewer is expected to provide the magazine with a high resolution photo of the interviewee, and three or more artwork samples (high resolution, 300 dpi or more) should the interviewee work in the visual arts, photography, fine arts, painting, among others. Contact information for the interviewee should be made available to the magazine, as this may be used in the process of fact-checking. The length of standard art reviews is 500 words; feature/essay art reviews are 1000 words maximum. 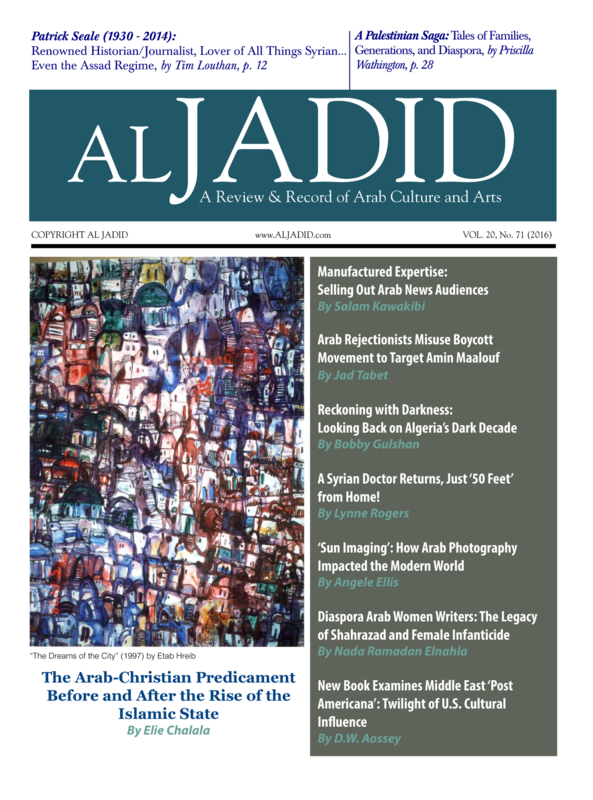 The reviewers are responsible for providing Al Jadid with high resolution artworks (300 dpi or more). Web images of artworks do not work in print/hard copies. 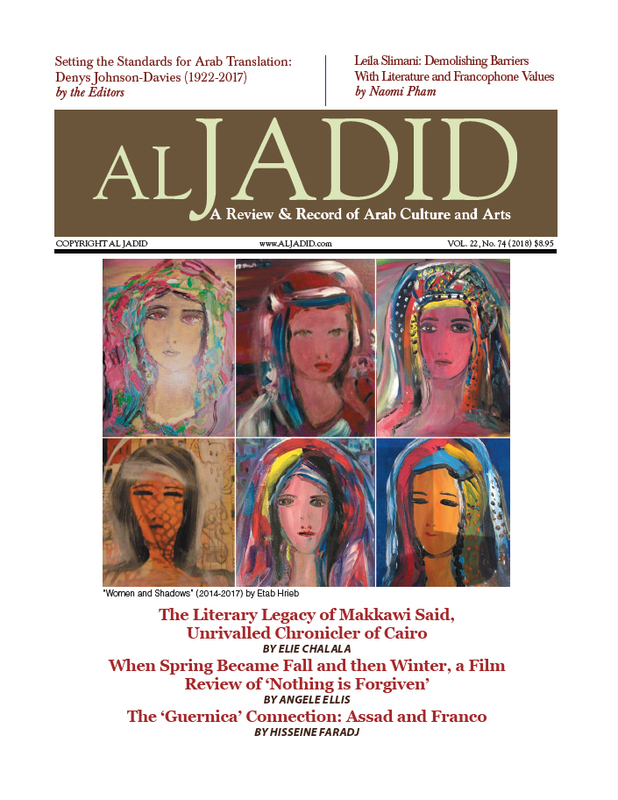 The reviewers are responsible for securing permission/rights from the artists for any images to be used in Al Jadid. We accept news stories if their focus is cultural and artistic events that have either taken place no more than four months from the time of submission or not expected to take place more than 4 months after the submission. These stories may be published immediately online and we cannot guarantee their publication in the print issues of Al Jadid. Their word-lengths can be as short as 200 and as long as 350 words. We consider artworks for both the magazine’s cover and interior, both in full-color and in black and white. Please submit these works in a low resolution of 72 dpi; should we accept any submission for publication, we will notify you to send us a high-resolution submission of 300 dpi or more.